I am thrilled that I finally finished the Ort Box! 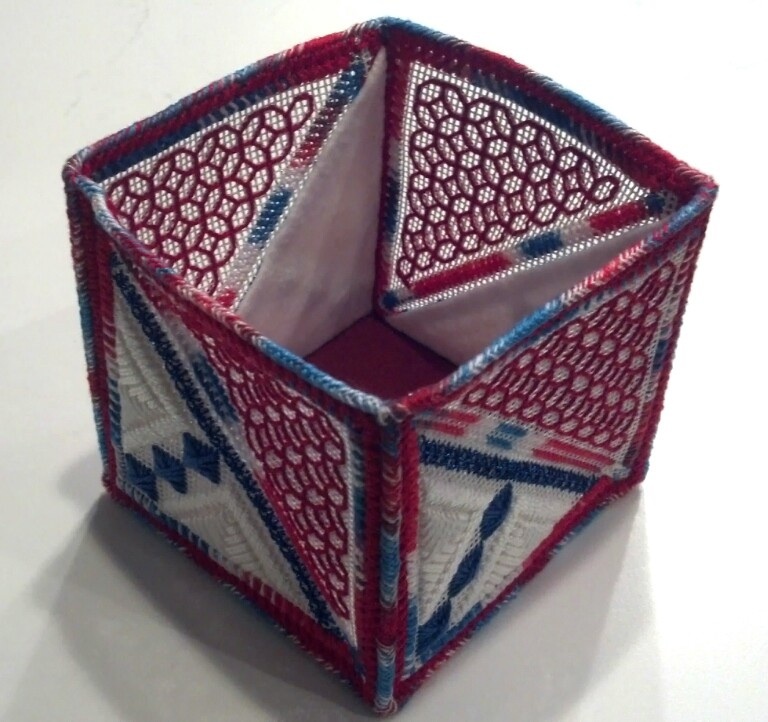 At least 2 others from ANG Main Line Stitchers are mailing ours in for the special exhibit at Seminar. I must admit I had quite a time with the bottom. I used a suede of some sort but it was fraying & had to turn a small edge. The tough part was connecting it to the sides. The holes seemed to shift out of alignment but I did it! 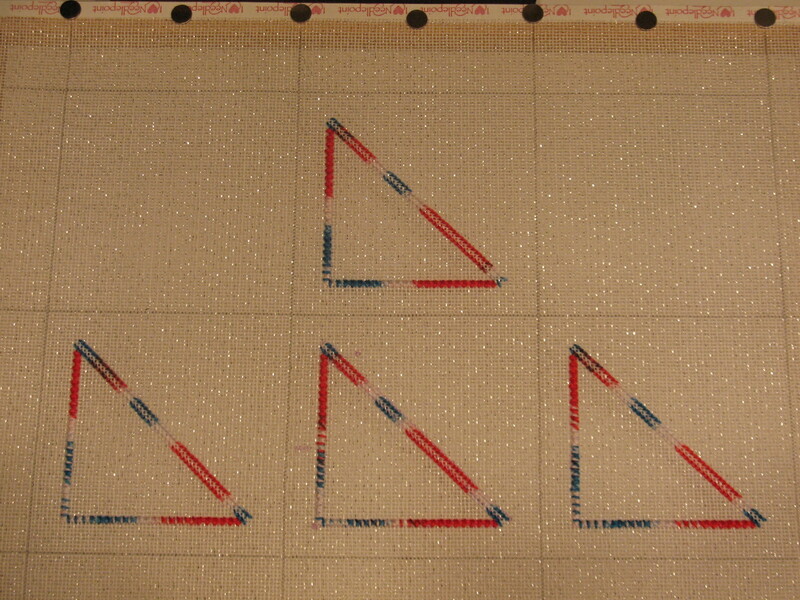 After that, I took a short cut & used felt with adhesive for the triangles. But, the binding stitching has gotten easier with each side edge probably because the lining isn’t sewed in like the bottom. 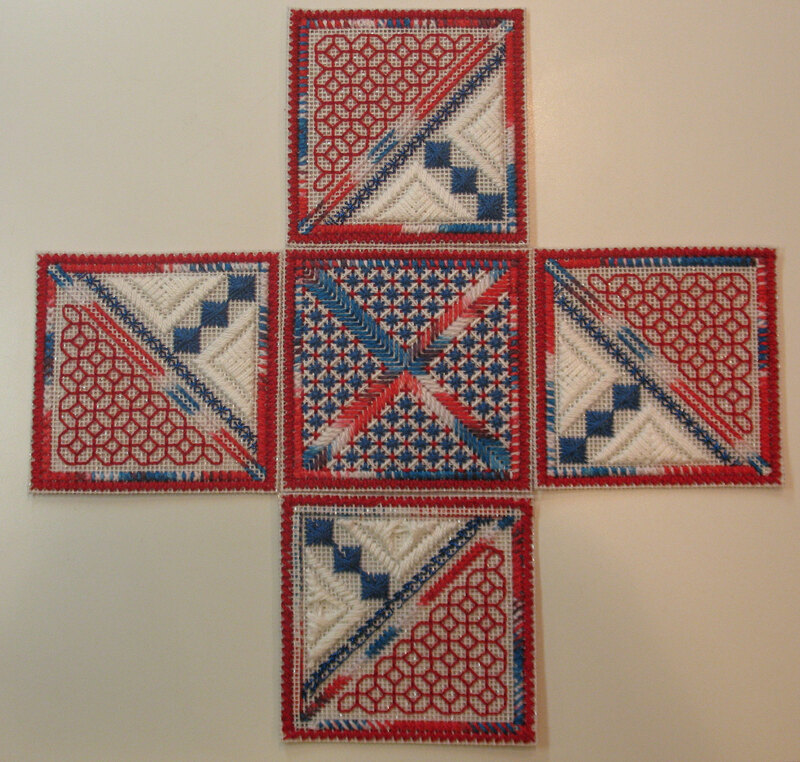 I used 2 threads of Wildflowers, Firecracker (154), an overdyed red,white, and blue thread. And, it took all but 24 inches of the 36 yards! That’s a lot of binding! Well, I am finally constructing the Ort Box (subject of previous logs). A couple of others in my chapter finished it too. And, we plan on sending them to Seminar in CA. We need to send them out by Aug 22 in order to get there in time. Did you participate? I’m curious to find out how many get sent. I’m sure someone will get a photo (I’m not going to seminar) – it’ll be cool to see them! This binding stitch is new for me & it took some getting used to but I finally got the hang of it. It shifts slightly and so it is important to keep the proper holes aligned. It took me hours today to get just the bottom attached! 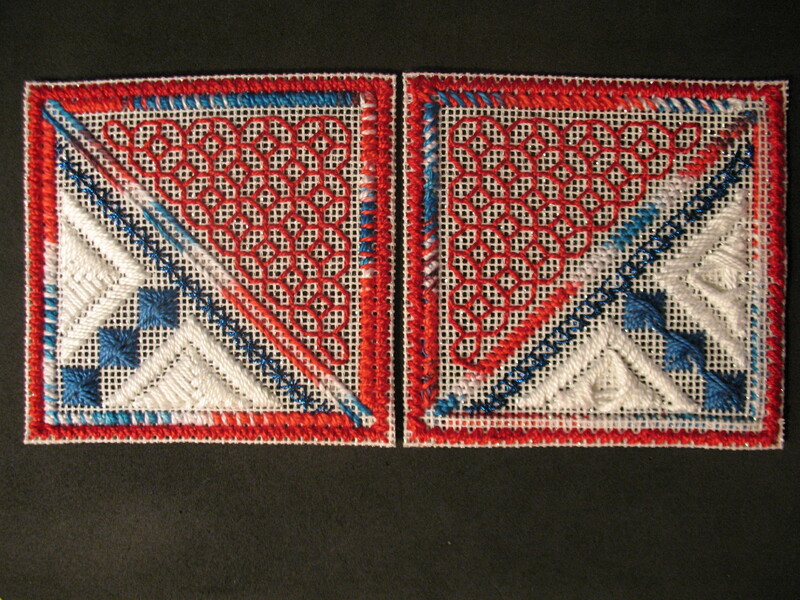 Yeah – I got the borders all stitched! Except for turning corners, it turned out fine. I must have restitched a few of them 6 times trying to get the reverse to work. If I got one right it was by accident. I finally gave up & moved on. The only thing that I can think was wrong was if I was stitching the rows left to right & I should have been going right to left. I’ll know & most you will know but the average person won’t. And, it’ll still open & close just fine. Can you tell which is the right side & which is the wrong side? You can’t tell from the blackwork! When you fold the edge you will leave a row of holes empty. That’s the best way I can describe it. And, this is the best picture I can get. Maybe someone at our meeting will be able to show me what I was doing wrong. I expect I’ll do another Ort Box with 18 count at some point. I have some canvases left. About 12 of us ended up working on it. I missed last month’s meeting but I heard that at least one has applied the lining. And, she was helping another to understand the instructions. I’m anxious to see one of us finish a box! I bought the lining at a Jo-Ann’s Fabric Store. I got a red. I got the blackwork finished & the bottom. I really had to focus doing the blackwork (Area 7 – top photo). I enjoyed it because it was a challenge but I wouldn’t choose to do a lot of it! 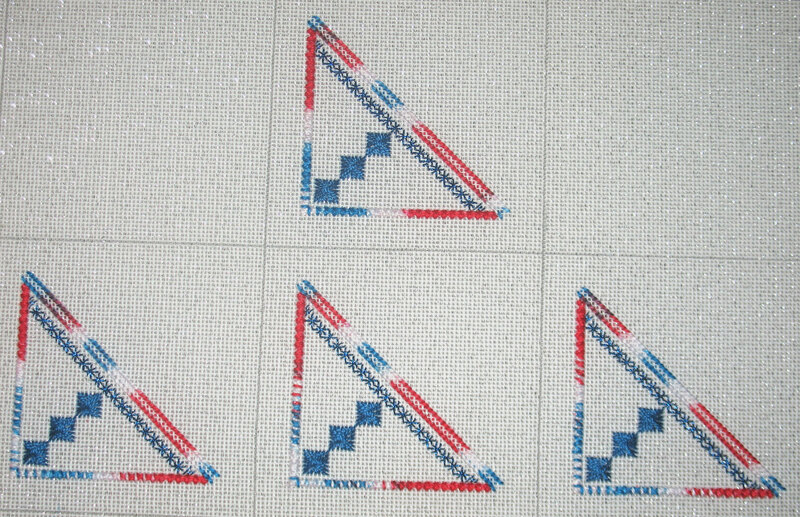 On the bottom square, I wish the overdyed thread on the one diagonal had some red & white in it. But, I didn’t notice that as I was stitching. I didn’t even notice it until I looked at the picture! Now, I can remove the canvas from the frame, cut the squares apart, & stitch the edges down! Well, I did have to go to the store for more threads because I’d already cut most of my DMC skeins in shorter pieces. Oh well – so much for using up stash. 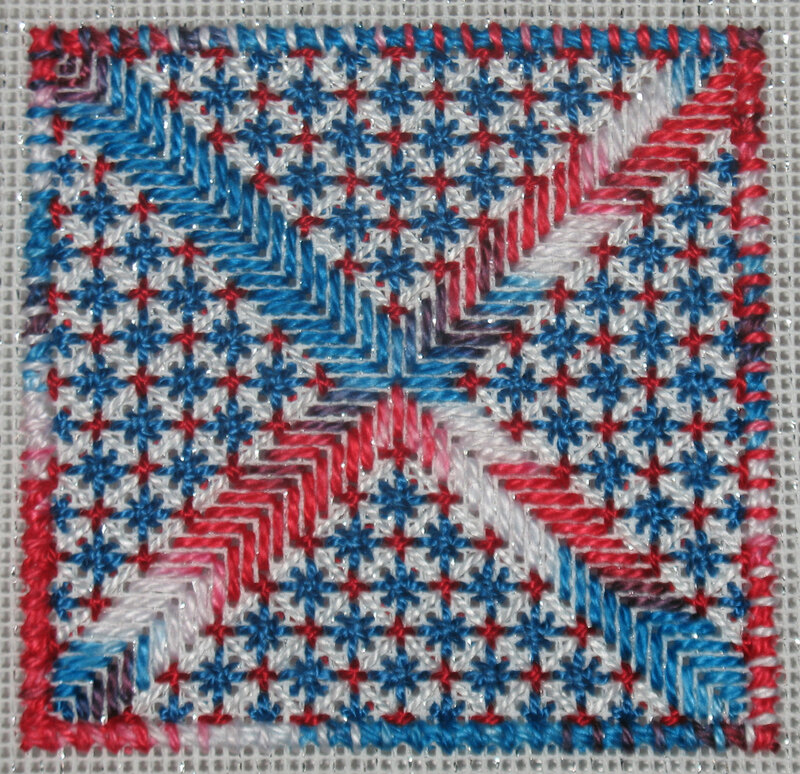 I found I needed 40″ to complete the row of double upright crosses for Area 3 (blue Kreinik #8 051HL), 40″ for each set of 3 Rhodes stitches for Area 4 (blue DMC 825) & 40″ (folded in half) for each V of upright gobelin stitches for Area 5. On 14 count, doubling the DMC #5 provided excellent coverage. And, it seemed easier to do each V separate rather than turning 90 degrees to work the second. Area 6 are Sprats Heads worked with 54″ folded in half to make a 2 ply coverage as well in white DMC #5. 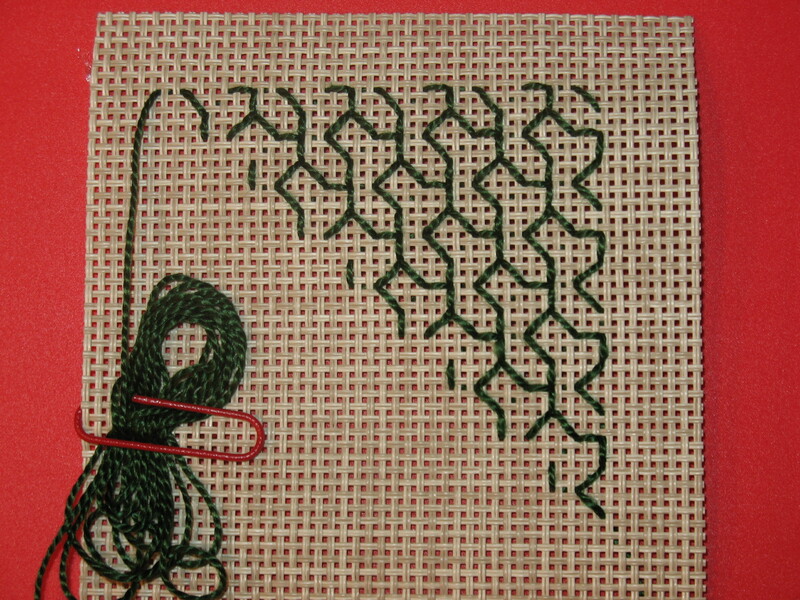 This is still working up quickly & as our monthly meeting approaches, I hope to complete the blackwork as well. We are off and running with the Ort Box. Directions were graciously provided directly from Marilyn Owen. And, Karen Milano at Nimble Needle gave us a very nice discount for INTERLOCKING canvas by the yard (of plain white 14 count, metallic silver and metallic gold 14 count, and plain white 18 count). Thanks to both!! Then, I cut it up & taped the edges for everyone in advance. However, I didn’t fully read the directions (there is a lot to make such a small box) & didn’t see that the metallic interlocking canvas will be harder to put together. But, a couple of us are electing to give it the old college try, including myself. Some pros & cons of 14 count vs 18 count: the 14 count will be a slightly larger box & require thicker threads such as DMC #5 Perle Cotton as opposed to the smaller 18 count box that calls for DMC #8 Perle Cotton & Floss. 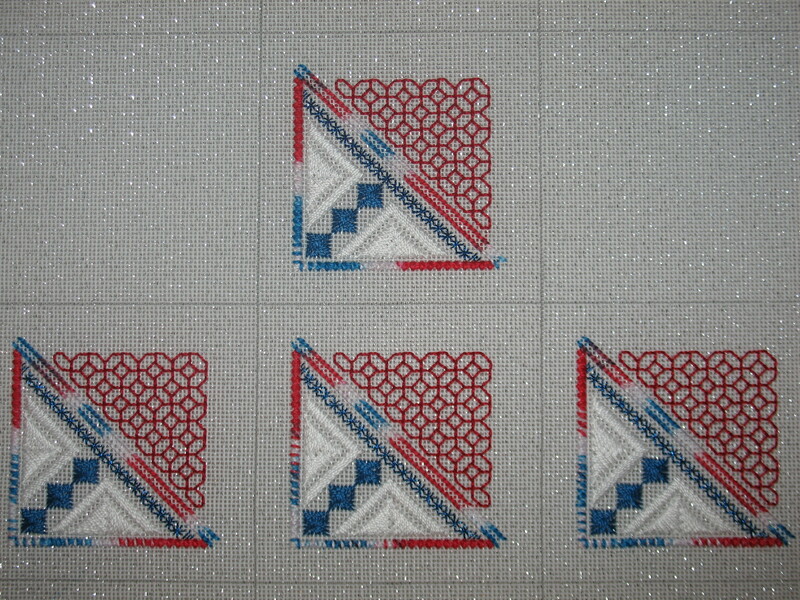 The odd rows all stop with the stitch going down and to the right. 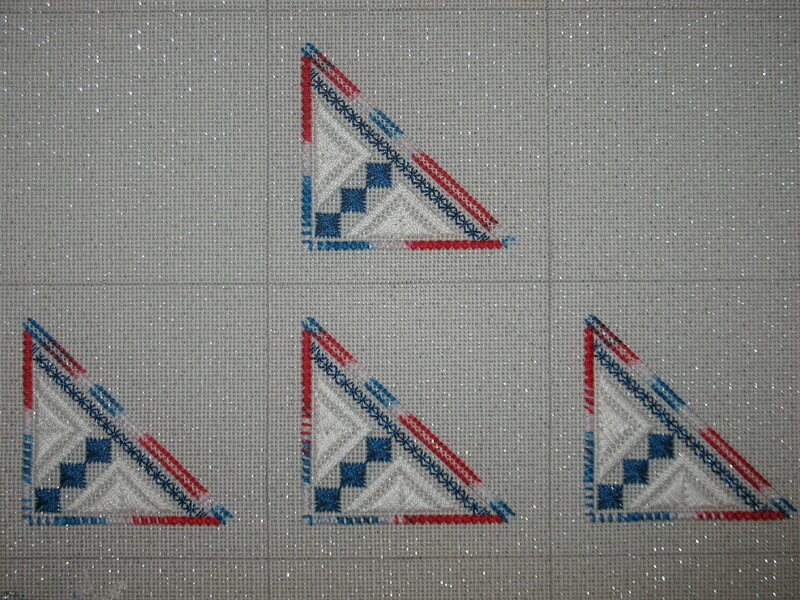 The even rows all stop with the stitch going straight down. I also put the rest of the rows into a diagram for my chapter members & photographed it row by row. 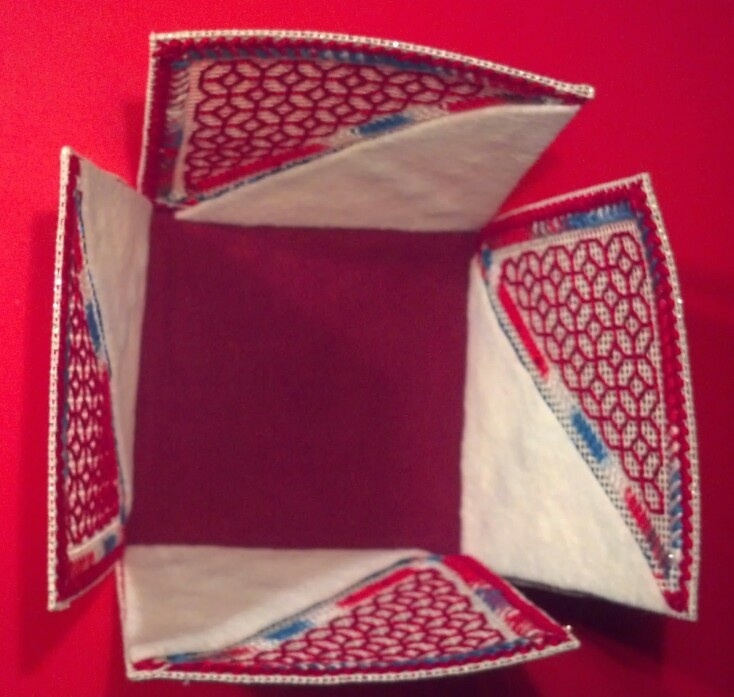 I used a red, white, & blue over dyed thread for Area 1 & Area 2 (on silver metallic canvas). I don’t have enough of the over dyed to do it for the blackwork. You really do need at least 7 feet for 14 count. So, I am weighing options! One way or another, I’m using my stash.